What to do when someone flies off the handle in public. A 90-pound weight loss without surgery? Hear one woman's personal tips that helped her get trim. 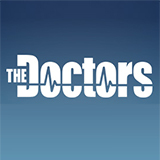 The Doctors was broadcast on One at Sunday 10 February 2019, 14:38.